Mycoplasma team is funded by different European grants supporting projects oriented to achieve a computational whole-cell model that could be used as tool for rational engineering of this microorganism as bacterial chassis for lung therapy or vaccination. Annually, infections caused by Mycoplasma species in poultry, cows, and pigs result in multimillion Euro losses in USA and Europe. There is no effective vaccination against many Mycoplasmas that infect pets, humans and farm animals (e.g. Mycoplasma bovis cow infection). Furthermore, most Mycoplasmas are difficult to grow in axenic culture, requiring a complex media that includes animal serum. Consequently, even in those cases for which effective vaccines are available (namely, M. hyopneumoniae in pigs and M. gallisepticum and M. synoviae in poultry), the production process of the vaccines is very irreproducible and prone to contamination by animal viruses. Here we will capitalize on our extensive systems biology knowledge of M. pneumoniae and on cutting-edge synthetic biology methodologies to design a universal Mycoplasma chassis that can be deployed as single- or multi-vaccine in a range of animal hosts. We envision an iterative workflow that is (whole-cell) model-driven and relies on a range of genome-editing and transplantation tools, circuit (re-)design and chassis plug-in as well as on assessment of vaccine performance pigs in an industrial setting. The chassis will be free of virulence determinants from M. pneumoniae and will be optimized for fast growth in a serum-free medium. Using this chassis, we will express heterologous antigens from one or more pathogens (i.e. Mycoplasma and virus) and biological adjuvants to create a targeted vector vaccine. Specifically in this project, we will target the development of attenuated and/or inactivated vaccine(s) against two Mycoplasma pathogens: M. hyopneumoniae (pigs) and M. bovis (cattle), and a combined one against M. hyopneumoniae and PRSSV virus (pigs). 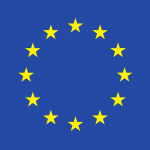 We will ensure that foreseeable risks are avoided, all ethical issues are handled in a transparent manner, and that our results and their implications are disseminated effectively and communicated efficiently with the European public. Engineering bacteria to deliver therapeutic agents or to present antigens for vaccination is an emerging area of research with great clinical potential. The most challenging issue in this field is selecting the right bacteria to engineer into what is referred to as a “chassis”. While the best chassis depends on the application, there are two common drawbacks to bacteria used currently—their complexity and the lack of quantitative information for many reactions—that limits genome engineering to classical trial-and-error approaches. 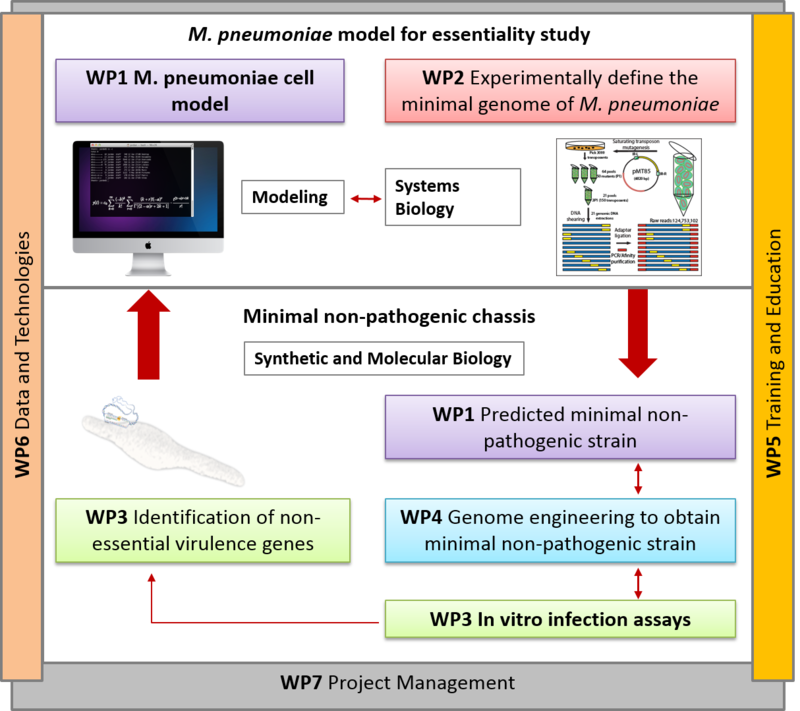 In this project, we want to engineer the genome-reduced bacterium M. pneumoniae using a data-driven, whole-cell model to engineer a chassis for human and animal therapy. Its small size (816 kb), the lack of a cell wall, and the vast amount of comprehensive quantitative omics datasets makes this bacterium one of the best candidates for chassis design. By combining bioinformatics, omics, and biochemistry approaches with genome engineering tools, systems biology analyses, and computational whole-cell models, MycoChassis aims to: i) develop a whole-cell model based on organism-specific experimental data that will be validated experimentally and that can predict the impact of genome modifications; ii) implement genome engineering tools to delete non-essential pathogenic and virulent elements predicted by the whole-cell model to engineer a therapeutical chassis; iii) use the whole-cell model to design and engineer genes and circuits to improve growth rate in a defined medium; iv) as a proof-of-concept, introduce orthogonal gene circuits to secrete peptides and enzymes capable of dissolving in vitro biofilms made by the lung pathogens Pseudomonas aeruginosa and Staphylococus aureus. This project will validate the usefulness of whole-cell models for synthetic biology by modelling multiple genomic modifications orientated to facilitate engineering of biological systems.